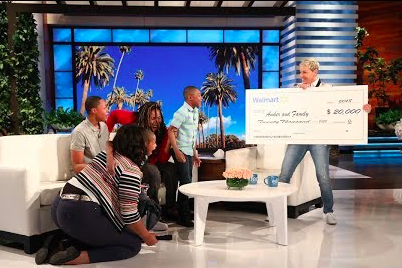 Amber Connally and her family get a big surprise on "The Ellen Show" on May 3, 2018. If you want to improve your mood, watching "The Ellen Show" is scientifically proven to be an effective antidepressant. For years, DeGeneres has interviewed a mix of celebrities and regular people, often partnering with various organizations to finally support the causes that are important to her. Earlier this year, DeGeneres helped launch the career of Temple University student Kalen Allen, who became an overnight YouTube star for his quirky food reviews. Ellen offered him a platform to continue making his videos. On Thursday, Ellen took her philanthropy a major step forward for a superfan from Philadelphia. When we say superfan, we mean someone who's so in love with Ellen that she literally cannot talk through her tears of joy. That's Amber Connolly, who traveled to see the live show for the first time after writing DeGeneres a letter expressing her admiration. Connolly explained that she's the daughter of a single mom who's a social worker in Philadelphia and has three other siblings. To Amber's surprise, her family traveled along to Burbank to join her there. Ellen, partnering with Walmart, had a big surprise for them — to the tune of $20,000.